It may seem quite odd that a professional ballerina would eventually become a successful business owner, however, it is in fact, the discipline and dedication of a ballerina’s lifestyle that got me to where I am today. Hours and hours of focused attention to detail, repetition and commitment, as well as passion and drive – these were traits that were necessary to get me through sometimes grueling days of ballet training and long nights of performances. It may seem like a fancy lifestyle, dressed up, looking pretty, performing on stage, but with all entertainment careers it is the behind the behind the scenes moments where all the hard work happens. 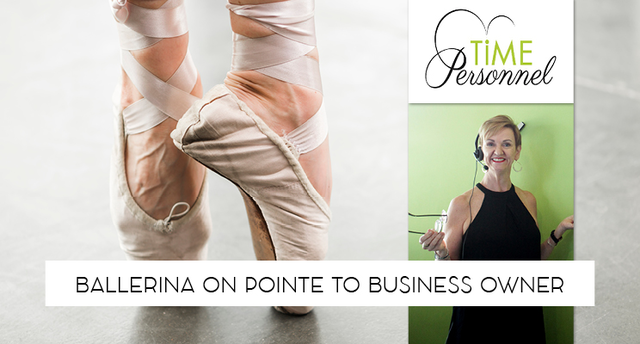 When it came time to leave the ballet life behind, I took that same dedication and focused on making a success of the career I was in, which started out as a receptionist, moved up to sales and then took the mad plunge to opening my own recruitment agency. It has been over 14 years since that nerve-wracking day and Time Personnel is still going strong. I believe my key to success has been to treat people with respect and warmth, which I do with all my clients, the candidates I meet and with my staff too. Time Personnel stands out from the crowd because of our Personality Differentiator. We realise that we are in a digital age, but that the personal touch can still be applied no matter who we deal with. If you are looking to partner with a recruitment company that will have your best interests at heart, reach out to Time Personnel today. We believe in OUR MOTTO!